Colorful glass bulbs rise or sink when the temperature of the room (and the liquid) changes. Pop quiz: A liquid's density changes in proportion to its what? C: (always choose C) Temperature. You can thank Galileo for that discovery—one that was so cool someone turned it into a thermometer. 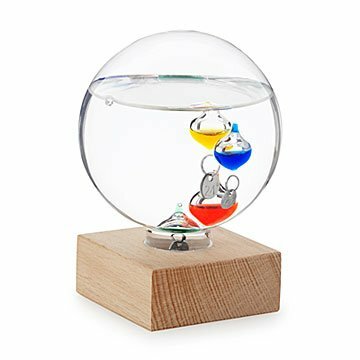 Colorful glass bulbs in different weights rise or sink when the temperature of the room (and the liquid) changes, creating subtle lava lamp-style movement. They also feature tags for both Fahrenheit and Celsius. While most versions of this thermometer are cylindrical, this design is circular and sits on a handsome wood base, making it a distinct desktop conversation starter. Made in China. I bought this for our Christmas gift exchange and ended up with the orb for myself! It is much smaller than I envisioned, but it looked great on our small desk. Not really used for weather, but more for curiosity and decor. Sadly, it banged into another item on the desk and shattered. I came back here to see what liquid was inside (the smell and slickness of it had me worried) and decided to review the thermometer only because it was so very fragile. I'm sad! It is in my office and it gives me a general idea a the room temp. in an old scientific manner. Its decorative, if it works, I'd purchase another. Daughter lives in an older bigger home and needs to regulate heat. Secret Santa for the win!! I chose this as a Secret Santa gift for my Chiropractor boss. We have in common an affinity for quirky, unusual, unique home accents. This is PERFECT!!! It's very unique and attractive. He will have many conversations over this piece. It's a beautiful orb that gets wedged into a piece of wood. It's nice and secure and once you figure out how to read the temp, it's pretty handy. It looks beautiful on a desk. Cool item.. just not sure how to read it. I have this product sitting on my desk at work. It's a pretty cool item, I'm just not sure how to read it yet. Beautiful and simple, fits in palm of hand. Very pretty gift that does not take up a lot of room. The globe is beautiful and the gift recipient loves it however, the globe doesn't fit into the wood base. Is she supposed to remove the plastic ring in the wood base?